Of all the relatives and ancestors who will make it into the narrative of Ancestors With Aprons, I was closest to my maternal grandmother, Vera May (Stout) Anderson (1881-1964). I will be telling a lot of stories about her, and already mentioned her in my introduction to the Anderson restaurant. But let’s start by visiting Grandma Vera in her kitchen in the middle of the twentieth century and work back from there at a later time. Two Veras. Grandma Vera Anderson at 50, holding me, about one year old. I can’t say I actually remember Vera Anderson from the time when I was one year old (in this picture), but I’m sure that I have memories from when I was three and more. We lived with her sometimes when I was very young, Then we moved back to Killbuck when I was in 8th grade and stayed there until I graduated from high school. I spent more time with her then than any other time. I picture her with her snow-white hair (she started turning gray in her twenties) in the big kitchen toward the back of her house. Or she was in the yard growing flowers or hanging out laundry. I remember her teaching me the right way to hang shirts on the line, and the smell of sheets and towels warm from sunshine and whipped dry by slight breezes. That habit of getting rid of old stuff accounts for why I do not have mementos from the Anderson Restaurant, or old cooking tools. It is something of a miracle that I have even a handful of recipes and some lovely pieces of china and silver. 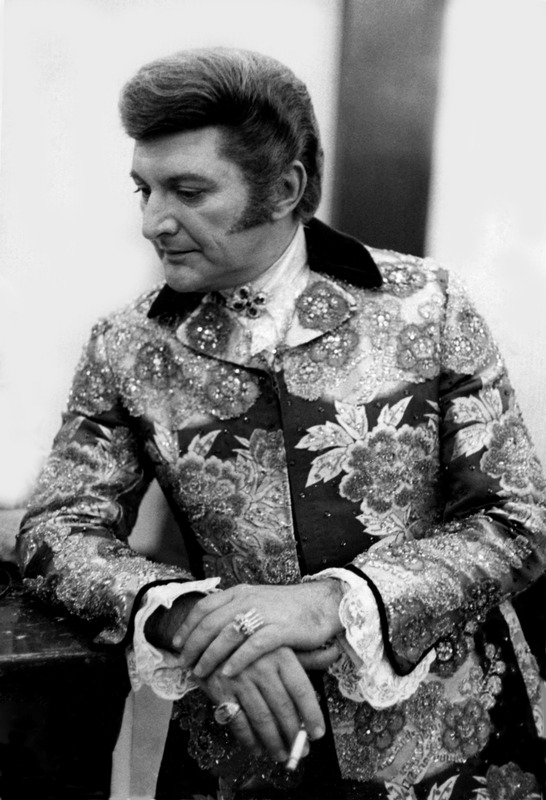 Showman Pianist Liberace in 1968. Photo by Allan Warren, used with Creative Commons license. Liking new things, Vera had a black and white TV set in the early 50s– many years before my father caved in and got one for our family. Killbuck, Ohio sits in a valley and in those days of dependence on rabbit ears on top of the set, her T.V. picture generally looked like a snow storm on a dark night. But she never missed the Saturday Night “wrassling” and the Liberace show, which I suppose proves something or other about her personality, but I can’t figure out exactly what. She swore she only liked Liberace because of the piano music. Maybe you can figure it out. Here is a TV clip of cross-dressing wrestler Gorgeous George on of the most popoular showman wrestlers from that time. Grandma Vera lived slightly more than 20 years after her husband died. People once asked her why she didn’t marry again. “Why would I want to do that?” she said. “I just got the cigar smoke out of the house.” She definitely treasured her independence. I suspect she really liked to cook, because even when she ate alone, she took the time to prepare a complete meal and sit at the table to eat. She ate all kinds of things that should be bad for her–particularly lots of sugar and salt. Growing up, I thought the only way to eat a stalk of celery, scallion or carrot was to first pour a mound of salt on the plate, and dunk the vegetable liberally before eating it. Anything that didn’t get salt got sugar. She loved sugar on tomatoes, which mystified me, because tomatoes fresh form the garden are sugar-sweet anyhow. In her later years Vera was diagnosed with diabetes and had to go to Millersburg–15 miles away–to get her insulin level tested and get an insulin shot. My Aunt Sarah would drive her there. Aunt Sarah said that as soon as Vera had her sugar tested and got her shot, she insisted that they stop at a restaurant and have a piece of pie–which of course would not count, because she’d already had her sugar test. A show called “LIfe Begins at Eighty” was prominent on early TV and I used to tease Grandma when she was in her sixties and seventies about what she was going to do when she reached that wonderful age. Being young, I assumed that my grandmother would always be around when I dropped in. She probably did not expect to reach 80, although her female ancestors all lived long lives for their eras. She lived to 83. But Vera’s real adventures were not in her eighties. They came much earlier. In her last few years, she had moved out of the big old 100-year-old home she was born in and her youngest son had died in a car accident. In May of 1963, Ken and I drove to Ohio on our way to the New York World’s Fair. On our way to his parents home to leave our two oldest boys (I was 5 months pregnant with the third), we stopped in Killbuck where Grandma Vera cooked us a pork chop dinner. I told her that my doctor told me that I should put my feet up as frequently as possible, and it would probably be a good idea for her, too. I don’t recall her exact reply, but it was probably something about having too much to do. When we returned from New York City and stopped at Ken’s parents house near Orrville, Ohio, no one was home. But I saw a clipping on the counter that the name ‘Vera Anderson’ caught my eye. In the short time we had been gone, she had suffered a heart attack and been taken to the hospital where she died. This entry was posted in family and tagged biography, Grandma Vera, Killbuck, Liberace, Vera Stout Anderson on April 27, 2013 by Vera Marie Badertscher.